And learn about WP gallery plugins like NextGEN Gallery & Co.
WordPress is a content management software, and content means texts, information, sharing stories. Are images associated with that? Most certainly. Although books can go without a single image throughout the whole book, websites and blogs of any kind are usually more versatile and good stories require good pictures to complement the overall essence of the story being told. Talking about a vacation in a beautiful country without sharing any of the pictures that were taken during this vacation, make a fairly weak story, and people will not be as receptive towards sharing it with their friends, as they would be if high-quality images were embedded alongside the original story. Images can often rescue your articles / posts from complete disaster, especially when it comes to tutorials and technical guides. Many webmasters find it easier to understand when a picture complements a particular piece of content. How exactly do you insert images in your WordPress posts and what else should you know about images on the web in general? Let’s find out. Whenever you click the Posts => Add New button in your WordPress dashboard, you’re greeted with a page that is home to the WYSIWYG content WordPress editor. Below the part where you enter the post title, you will see a button called Add Media, where you can upload one or more images to your post. These are not featured images though, for more information on featured images please see: How to use featured images in WordPress. On the right hand side, there’s an image editing options panel in which you can specify several settings, including the dimensions of the image you would like to use, and also to specify a particular “caption” that describes your photos the best. So the basic process of embedding an image, including caption, in a WordPress post is quite straightforward, and easy as some would say. What about other techniques? One other way to embed images in WordPress is by using a Gallery Plugin – although WordPress also offers built-in support for galleries. WordPress gallery plugins will more often than not come with a set of unique features that will greatly enhance the way you insert images in your WordPress posts. Which is the absolute best WordPress gallery plugin, you might ask? Ability to import image meta data. Create custom albums from your existing galleries. On top of all those amazing features, with NextGEN Gallery you will be able to display your images in two different ways; as slideshow images, and as thumbnail galleries. Both of which will provide an extensive list of features for having full-control over how the pictures look and feel to the reader. This particular gallery plugin has a very easy learning curve, and has been built with beginners in mind. One thing this gallery plugin will not do however, is optimize your images for optimal performance. This is still a feature that developers are trying to figure out how to implement natively in the plugins they create. Luckily for WordPress users, a website called TinyPNG has launched a freely available WordPress plugin that will optimize all the images you upload automatically. TinyPNG has long been known as a reliable image compression service, and to have that compressing functionality integrated directly into your image uploading process is great. As you upload images to your WordPress media library, the Compress JPEG & PNG images plugin will automatically detect the type of the image and use the appropriate image compression service (TinyPNG or TinyJPG respectively) to optimize your images before they’re fully uploaded. Thanks to the lightning fast servers that TinyPNG service uses, this process is pretty much seamless and doesn’t interfere with your overall image uploading process. On average JPEG images are compressed by 40-60% and PNG images by 50-80% without visible loss in quality. Image optimization has long been associated with improvements in site speed, and thus improvement in the number of people who visit your site and even interact with it. Page speed is also a very well known Google ranking factor, so there really is no reason not to use an image optimization plugin, unless you want to do each optimization manually. 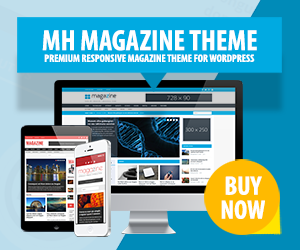 All WordPress themes by MH Themes make use of this great feature. That means when you upload a featured image to a post, the image will be inserted on single posts right away and also WordPress will generate several thumbnails that will be shown throughout your theme on archives, in widgets or else. And adding a featured image is as easy as clicking a button. Here you can find more information: How to use featured images in WordPress.